Having played and beaten all of the Senran Kagura titles released so far, it’s fair to say that I’m familiar with the franchise. Despite the criticism that the series generally receives for its fan service, I do enjoy the combo focused gameplay found in most of the titles along with its mostly likable cast of characters. Senran Kagura: Peach Beach Splash takes the series in a different direction, ditching the hack-and-slash combat and reshaping it into a third person shooter style. It isn’t a completely clean transition but for the most part, it works surprisingly well. Senran Kagura: Peach Beach Splash (PlayStation 4) – gameplay image credit: XSEED Games. Senran Kagura: Peach Beach Splash continues the alternate timeline that began with Senran Kagura: Shinovi Versus. The plot this time around is as thin as it could possibly be. 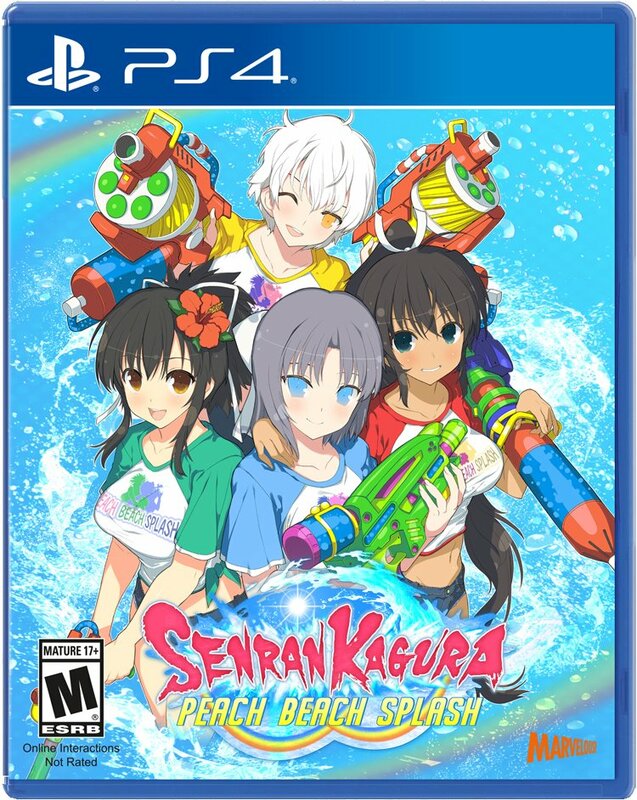 The girls of Hanzo, Hebijo, and Gessen Academy have all been teleported to an isolated island where they are forced to take part in the Peach Beach Splash water gun tournament. That’s about it. Nothing of significance really happens during the game’s plot but there are some nice bits of character growth for some of the girls. All of the characters who appeared in last year’s Senran Kagura: Estival Versus are present in this game along with three new characters that made their debut appearance in the Japanese exclusive mobile game. It’s easy to see that Senran Kagura; Peach Beach Splash was built off of a customized version of the engine used for Estival Versus. Assets like character models have been reused with no changes made. Peach Beach Splash does feature all-new maps though, featuring more layers than previous entries. These newly designed arenas work far better with the changes made to the core gameplay rather than Estival Versus’ mostly empty stages. Like with previous titles, Senran Kagura: Peach Beach Splash is entirely voiced in Japanese with all of the voice actors reprising their roles. There are four main modes to Senran Kagura: Peach Beach Splash. The game’s main story mode features three stories with ten chapters told from the perspective of each faction with one extra story mode that becomes unlocked after completing all three. The chapters usually come with two goals: defeat all the enemies or get more points against the opposing team by defeating them. The second mode offers more of the same but with smaller stories that focus on certain members of the cast. The third mode contains no story but features pure 5v5 battles with set teams. When playing Peach Beach Splash, it’s important to remember that this isn’t a typical Senran Kagura game despite resembling one. Aside from a slow melee attack, the girls of Senran Kagura have completely abandoned all of their ninja abilities for a variety of water guns. The different weapons can be wielded by any of the playable characters allowing you to choose whoever your favourite is. However, this also means that all of the characters feel exactly the same. Battles can get chaotic as you’re often up against multiple opponents, trying to maintain distance and avoiding getting hit while also attacking and focusing on your ammo supply. The game also features an aim assist which helps greatly considering the agility of your constantly moving targets. While there are no ninja transformations or secret ninja arts like in previous games, equippable skill cards can be used in their place. Along with each having their own unique piece of artwork, skill cards can be used to cause various effects such as summoning a strong attack or increasing your attack power. This would almost be a suitable replacement for ninja arts if they weren’t so annoying to get. Skill cards come in packs that are rewarded after each mission. These packs contain completely random assortments of cards with varying rarities. Since you’re able to pull doubles, there’s no telling how long you’ll be grinding to get that hyper rare skill card you really want. When it comes to fan service, this game isn’t really any more lewd than what the series is accustomed to—but it is more upfront. The whole point of the Peach Beach Splash tournament is to get all of the girls in bathing suits, spraying water all over each other. Though the focus is on having the girls in swimsuits, Peach Beach Splash still features a lot of the same character customization found in Estival Versus. In the dressing room, a variety of different swimsuits can be worn, alongside many of the ninja outfits that the girls normally wear. These classic outfits can be torn during gameplay the same way as well. Additionally, interacting with defeated girls can initiate a special finish. During these, you can aim and fire at specific parts of the girl’s outfit and strip her for extra points. It’s just as perverted as it sounds and changes the girl’s pose depending on what weapon you’re using. Multiplayer is fun but a bit broken. By connecting online, you can test your skills against other players in a few unique game types. It’s definitely more fun going up against people who use real strategy and it’s cool seeing everyone’s dressed up characters, essentially looking completely original. The problem with multiplayer is that you go in using your own custom deck of skill cards and weapons, meaning that the player that has spent more time grinding for better cards is typically in the best position to win. Multiplayer should really only be played after you’ve completed the single player modes. I enjoyed playing Senran Kagura Peach Beach Splash but I wouldn’t recommend it over any of the more traditional entries in the series. The game does well as a first attempt at a new genre but it takes away too much of what makes each of the characters unique in anyway aside from voiced lines. The forced grinding can also be a drag for a lot of people, especially if you’re hoping to stand a chance online. Despite this, its quick paced gameplay is fun in short bursts and if you’re familiar with the characters, Senran Kagura: Peach Beach Splash is essentially an excuse to literally see more of them. Liked this article and want to read more like it? Check out Remington’s take on Yakuza Kiwami for PlayStation 4 and Sonic Mania for PlayStation 4! Senran Kagura: Peach Beach Splash takes the series in a different direction, ditching the hack-and-slash combat and reshaping it into a third person shooter style.